My relationships with coffee are the longest and the sweetest. 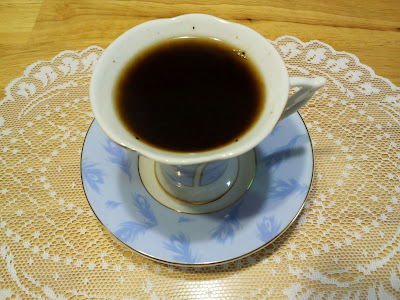 I used to drink coffee 3-4 time a day, at home, on a go, in the office, back at home. Now I drink it 3-4 times a month at home, slowly, indulging in every sip. It became more of the ritual, it's a "Me" time. 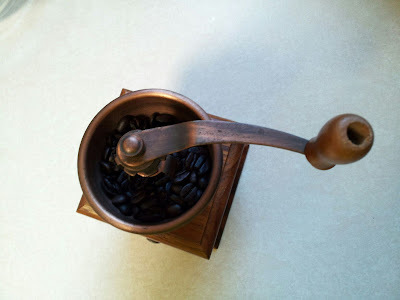 Coffee beans go into the grinder and I crank it rhythmically a few times until beans are ground. That motion is the best stress "remedy" for me. Then I empty the coffee into a coffee pot, the old fashioned one, pour hot water over it and put on the stove. I stir it until froth starts to raise and then I lift the pot from the heat. I add a pinch of high quality salt, and pour it in a coffee cup. Coffee aroma fills the kitchen, I close my eyes and take a deep breath. Mmmm. I am in paradise! Do you have a "Me" time? How do you like to spend it? Thank you Claudia. Tea wakes me up in the morning, I don't have cravings for coffee anymore. But I love the ritual. I love your ritual! I'm not a tea drinker, but I love the ritual of tea. My "me" time is either at the movies or I go to a fast-food restaurant (I know - but it's my indulgence) and sit with a diet soda and a book. I don't know why, but I LOVE those places! Everyone has a right to their own "me" time, and place doesn't matter. Whatever helps you to relax and just be you. Thanks for the comment! 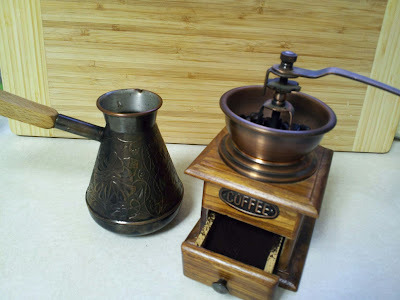 I love the old coffee-tradition! ^^ I have a lot of me-time, but when I'm able to sew, cook, make bentos or show off my art skills in some way - that's when I'm the happiest and the most stress-free. And that is what makes "me" time - whatever brings happiness and joy. Thanks ! I feel the exact same way about a nice warm cup of tea! I love to sit with a cup and just do nothing for 10 minutes after I get the kids out the door to school. I hear you Jen. It's amazing how just 10 minutes can transform us, isn't it? !